Lucas Martell’s first foray into animation was his short film Pigeon: Impossible. The 6-minute short – see below – took nearly 5 years to complete and was a crash course on every aspect of CG production. The final film screened in over 250 festivals in 43 countries. It won more than 20 awards including Best Short at the Oscar-qualifying Montreal World Film Festival and Best in Show at ArtFutura in Spain. The film was also a viral hit, having passed 11.5 million views on YouTube – scroll down to watch it. Lucas’ most recent film is The OceanMaker which he wrote, directed, and co-produced with his wife Christina Martell. He and Christina will participate in a Q&A after it screens in the Big Dreams package. On Saturday, May 14, Lucas will present a half-day workshop called Making Oceans – Behind the Scenes of “The OceanMaker” (award-winning animated short). The OceanMaker has received much attention, not only for its powerful story and animation, but also for the unique way in which it was made. Lucas knew that the film would require a team of professional artists, and the most efficient use of their time would only be possible if everyone worked together in the same location. But how do you convince professionals to leave their paying jobs to spend nearly two months working on a low-budget independent project? Bribe them. Rather than a typical studio environment, production was moved to a small Caribbean island in Belize. Lucas’ pitch to the crew was simple: “If you’d be willing to work for deferred payment, we’ll cover the costs for you to travel and live in a tropical paradise.” The result was much like an artist’s retreat. In just 7 weeks, the crew of 8 finished nearly half of the film using nothing but laptops. 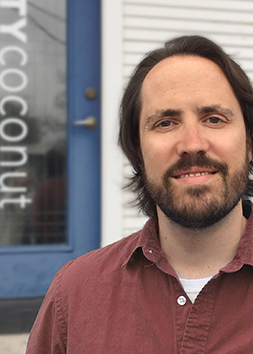 Lucas continues to develop new film and TV projects, as well as running Mighty Coconut, a full-service VFX and animation studio in Austin, Texas that specializes in original and branded content.